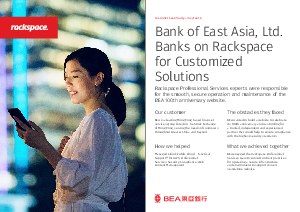 The Bank of East Asia (BEA), a leading Hong Kong based financial services group, marked its 100th anniversary with the launch of a standalone, celebratory website on the AWS cloud. BEA involved Rackspace Professional Services from the beginning, to tap its expertise and advice on advanced cloud management, best practices and security – for the design, configuration and execution of an AWS environment that’s compliant to the highest security standards. To ensure that the site runs well, BEA additionally chose Fanatical Support for AWS to gain access to tools, automation and best practices from Rackspace’s certified AWS architects, along with 24x7x365 access to the global support team. Today, the BEA 100th Anniversary website is operated and maintained smoothly and securely, thanks to Rackspace’s cloud experts and its host of professional and managed services.